A loading gauge defines the maximum height and width for railway vehicles and their loads to ensure safe passage through bridges, tunnels and other structures. Classification systems vary between different countries and gauges may vary across a network, even if the track gauge remains constant. The loading gauge limits the size of passenger carriages, goods wagons (freight cars) and shipping containers that can be conveyed on a section of railway line. It varies across the world and often within a single railway system. Over time there has been a trend towards larger loading gauges and more standardization of gauges; some older lines have had their structure gauges enhanced by raising bridges, increasing the height of tunnels and making other necessary alterations. Containerisation and a trend towards larger shipping containers has led rail companies to increase structure gauges to compete effectively with road haulage. The term "loading gauge" can also refer to a physical structure, sometimes using electronic detectors using light beams on an arm or gantry placed over the exit lines of goods yards or at the entry point to a restricted part of a network. The devices ensure that loads stacked on open or flat wagons stay within the height/shape limits of the line's bridges and tunnels, and prevent out-of-gauge rolling stock entering a stretch of line with a smaller loading gauge. Compliance with a loading gauge can be checked with a clearance car. In the past, these were simple wooden frames or physical feelers mounted on rolling stock. More recently lasers are used. The loading gauge is the maximum size of rolling stock. This is distinct from the structure gauge, which is the minimum size of bridges and tunnels, and must be larger to allow for engineering tolerances and car motion. The difference between the two is called the clearance. The terms "dynamic envelope" or "kinematic envelope" – which include factors such as suspension travel, overhang on curves (at both ends and middle) and lateral motion on the track – are sometimes used in place of loading gauge. The height of platforms is also a consideration for the loading gauge of passenger trains. Where the two are not directly compatible, stairs may be required, which will increase loading times. Where long carriages are used at a curved platform, there will be gaps between the platform and the carriage door, causing risk. Problems increase where trains of several different loading gauges and train floor heights use (or even must pass without stopping at) the same platform. The size of load that can be carried on a railway of a particular gauge is also influenced by the design of the rolling stock. 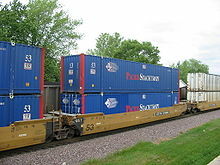 Low-deck rolling stock can sometimes be used to carry taller 9 ft 6 in (2.9 m) shipping containers on lower gauge lines although their low-deck rolling stock cannot then carry as many containers. Operate at low speed, especially in places with limited clearance, such as platforms. Cross over from a track with inadequate clearance to another track with greater clearance, even if there is no signalling to allow this. Prevent operation of other trains on adjacent tracks. Use refuge loops to allow trains to operate on other tracks. Use of Schnabel cars (special rolling stock) that manipulate the load up and down or left and right to clear obstacles. Remove (and later replace) obstacles. Use gauntlet track to shift the train to side or center. For locomotives that are too heavy, ensure that fuel tanks are nearly empty. Turn off power in overhead wiring or in the third rail. Rapid Transit (metro) railways generally have a very small loading gauge, which reduces the cost of tunnel construction. These systems only use their own specialised rolling stock. The loading gauge on the main lines of Great Britain, most of which were built before 1900, is generally smaller than in other countries. In mainland Europe, the slightly larger Berne gauge (Gabarit passe-partout international, PPI) was agreed to in 1913 and came into force in 1914. As a result, British (passenger) trains have noticeably and considerably smaller loading gauges and smaller interiors, despite the track being standard gauge along with much of the world. This results in increased costs for purchasing trains as they must be specifically designed for the British network, rather than being purchased "off-the-shelf". For example, the new trains for HS2 have a 50% premium applied to the "classic compatible" sets that will be able to run on the rest of the network, meaning they will cost £40 million each rather than £27 million for the captive stock (built to European standards and unable to run on other lines), despite the captive stock being larger. The International Union of Railways (UIC) has developed a standard series of loading gauges named A, B, B+ and C.
PPI – the predecessor of the UIC gauges had the maximum dimensions 3.15 by 4.28 m (10 ft 4 in by 14 ft 1 in) with an almost round roof top. UIC A: The smallest (slightly larger than PPI gauge). Maximum dimensions 3.15 by 4.32 m (10 ft 4 in by 14 ft 2 in). UIC B: Most of the high-speed TGV tracks in France are built to UIC B. Maximum dimensions 3.15 by 4.32 m (10 ft 4 in by 14 ft 2 in). UIC B+: New structures in France are being built to UIC B+. Up to 4.28 m (14 ft 1 in) it features a width of 2.50 m (8 ft 2 in) to accommodate ISO containers. UIC C: The Central European gauge. In Germany and other central European countries, the railway systems are built to UIC C gauges, sometimes with an increment in the width, allowing Scandinavian trains to reach German stations directly, originally built for Soviet freight cars. Maximum dimensions 3.15 by 4.65 m (10 ft 4 in by 15 ft 3 in). In the European Union, the UIC directives were supplanted by ERA Technical Specifications for Interoperability (TSI) of European Union in 2002, which has defined a number of recommendations to harmonize the train systems. The TSI Rolling Stock (2002/735/EC) has taken over the UIC Gauges definitions defining Kinematic Gauges with a reference profile such that Gauges GA and GB have a height of 4.35 m (14 ft 3 in) (they differ in shape) with Gauge GC rising to 4.70 m (15 ft 5 in) allowing for a width of 3.08 m (10 ft 1 in) of the flat roof. All cars must fall within an envelope of 3.15 m (10 ft 4 in) wide on a 250 m (12 ch) radius curve. The TGVs, which are 2.9 m (9 ft 6 in) wide, fall within this limit. The designation of a GB+ loading gauge refers to the plan to create a pan-European freight network for ISO containers and trailers with loaded ISO containers. These container trains (piggy-back trains) fit into the B envelope with a flat top so that only minor changes are required for the widespread structures built to loading gauge B on continental Europe. Currently, some structures on the British Isles are extended to fit with GB+ as well, where the first lines to be rebuilt start at the Channel Tunnel. Many member states' legacy railways, notably those in Great Britain, do not conform to the TSI specification and, given the cost and disruption entailed, are not likely to be retrofitted other than for GB+. G1 / UIC 505-1 T 11 3.150 m 4.280 m 3.290 m 4.310 m Static profile also known as Berne gauge, PPI or OSJD 03-WM. G2 T 14 4.650 m 4.680 m Formerly UIC C; Static profile also known as OSJD 02-WM. DE3 not defined Expansion for G2, part of TEN-T regulations. GC 3.150 m 4.650 m 4.700 m Formerly UIC C1. SE-C 3.600 m 4.830 m not defined The future European standard. Double-decker carriage as used on French TGV railways. A specific example of the value of these loading gauges is that they permit double decker passenger carriages. Although mainly used for suburban commuter lines (in Austria, Belgium, the Czech Republic, Denmark, Finland, France, Germany, Italy, Lithuania, Poland, Portugal, Russia, Slovakia, Spain, Sweden, and Switzerland as well as other locations around the world, including Sydney, Australia), France is notable for using them on its high speed TGV services: the SNCF TGV Duplex carriages are 4.32 metres (14 ft 2 in) high, and the Netherlands and Switzerland feature large numbers of double decker intercity trains as well. Great Britain has (in general) the most restrictive loading gauge (relative to track gauge) in the world. This is a legacy of the British railway network being the world's oldest, and having been built by a plethora of different private companies, each with different standards for the width and height of trains. After nationalisation, a standard static gauge W5 was defined in 1951 that would virtually fit everywhere in the network. The W6 gauge is a refinement to W5 and the W6a changed the lower body to accommodate third-rail electrification. While the upper body is rounded for W6a with a static curve, there is an additional small rectangular notch for W7 to accommodate the transport of 2.44 m (8 ft 0 in) ISO containers and the W8 loading gauge has an even larger notch spanning outside of the curve to accommodate the transport of 2.6 m (8 ft 6 in) ISO containers. While W5 to W9 are based on a rounded roof structure, those for W10 to W12 define a flat line at the top and, instead of a strict static gauge for the wagons, their sizes are derived from dynamic gauge computations for rectangular freight containers. Network Rail uses a W loading gauge classification system of freight transport ranging from W6A (smallest) through W7, W8, W9, W9Plus, W10, W11 to W12 (largest). The definitions assume a common "lower sector structure gauge" with a common freight platform at 1,100 mm (43.31 in) above rail. In addition, gauge C1 provides a specification for standard coach stock, gauge C3 for longer MkIII coaching stock, gauge C4 for Pendolino stock and gauge UK1 for high-speed rail. There is also a gauge for locomotives. The size of container that can be conveyed depends both upon the size of the load that can be conveyed and the design of the rolling stock. W6a: Available over the majority of the British rail network. W8: Allows standard 2.6 m (8 ft 6 in) high shipping containers to be carried on standard wagons. W10: Allows 2.9 m (9 ft 6 in) high Hi-Cube shipping containers to be carried on standard wagons and also allows 2.5 m (8 ft 2 in) wide Euro shipping containers. Larger than UIC A.
W11: Little used but larger than UIC B.
W12: Slightly wider than W10 at 2.6 m (8 ft 6 in) to accommodate refrigerated containers. Recommended clearance for new structures, such as bridges and tunnels. UIC GC: Channel Tunnel and Channel Tunnel Rail Link to London; with proposals to enable GB+ northwards from London via an upgraded Midland Main Line. A strategy was adopted in 2004 to guide enhancements of loading gauges and in 2007 the freight route utilisation strategy was published; this identified a number of key routes where the loading gauge should be cleared to W10 standard and, where structures are being renewed, that W12 is the preferred standard. 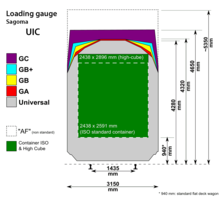 Height and width of containers that can be carried on GB gauges (Height by width). Units as per source material. Central line with tunnels of 11 ft 8 1⁄4 in (3.56 m), increased on curves, reduced to 11 ft 6 in (3.51 m) near to stations. 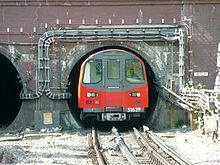 This makes Central line trains unique on the London Underground system because, although the loading gauge of the rolling stock is the same as the other 'tube' lines, the smaller size of the tunnel requires that the positive conductor rail is 1.6 in (41 mm) higher than on all other lines. A Parliamentary committee headed by James Stansfeld then reported on 23 May 1892, "The evidence submitted to the Committee on the question of the diameter of the underground tubes containing the railways has been distinctly in favour of a minimum diameter of 11 ft. 6 in." After that, all tube lines were at least that size. Victoria line with tunnels of 12.5 ft (3.81 m); enlarged to reduce air friction. Class SE-A is 3.40 by 4.65 m (11 ft 2 in by 15 ft 3 in). Similar to OPS-NL (Netherlands), Victorian (Australia) and Chinese loading gauges. Class SE-B is 3.40 by 4.30 m (11 ft 2 in by 14 ft 1 in). Similar to Norwegian loading gauge. Class SE-C is 3.60 by 4.83 m (11 ft 10 in by 15 ft 10 in) with a completely flat roof top. Similar to OPS-GC (Netherlands) loading gauge. Malmbanan north of Kiruna was the first electrified railway line in Sweden and have limited height clearance (SE-B) because of snow shelters. On the rest of the network belonging to Trafikverket, the structure gauge accepts cars built to SE-A and thus accepts both cars built to UIC GA and GB. Some modern electric multiple-units, like Regina X50 with derivatives, are somewhat wider than normally permitted by SE-A at 3.45 m (11 ft 4 in). This is generally acceptable as the extra width is above normal platform height, but it means that they can not use the high platforms that Arlanda Express uses (Arlanda Central Station has normal clearances). The higher width allows sleeping cars in which tall people can sleep with straight legs and feet, which is not the case on the continent. When building new railways or extensive reinvestments are made to the existing railway infrastructure, the gauge is expanded to SE-C that also accepts UIC GC. The structure gauge on the bulk of the system already (2012) allows large cars built to SE-C, albeit with restrictions and a special permit. The remaining limitation is the track circuits, the blocks are not dimensioned for the extra width and a large car placed to close to a turnout at a passing loop may intrude on the structure envelope of the through line. As a stop-gap this is generally solved by adding an extra normal-sized car at the tail-end to ensure that no part of the consist obstruct the space needed by passing trains (the engine serves the same function at the front-end). The larger cars are also barred from using certain industrial spurs leading to warehouses or loading docks built for the narrower cars. The SE-C loading gauge is the future European standard, for the 1,435 mm (4 ft 8 1⁄2 in) Rail Baltica II and the Narvik to Tel-Aviv train routes including the fixed rail links between Sweden and Poland and the second Marmaray fixed rail link. In the Netherlands, a similar shape to the UIC C is used that rises to 4.70 m (15 ft 5 in) in height. The trains are wider allowing for 3.40 m (11 ft 2 in) width similar to Sweden. About one third of the Dutch passenger trains use double-decker railcars. However, Dutch platforms are much higher than Swedish ones. Betuweroute: 4.10 by 6.15 m (13 ft 5 in by 20 ft 2 in) to allow double stacked container trains in the future. The present overhead line does not allow this height, as it has to follow standards. The American loading gauge for freight cars on the North American rail network is generally based on standards set by the Association of American Railroads (AAR) Mechanical Division. The most widespread standards are AAR Plate B and AAR Plate C, but higher loading gauges have been introduced on major routes outside urban centers to accommodate rolling stock that makes better economic use of the network, such as auto carriers, hi-cube boxcars, and double-stack container loads. Listed here are the maximum heights and widths for cars. 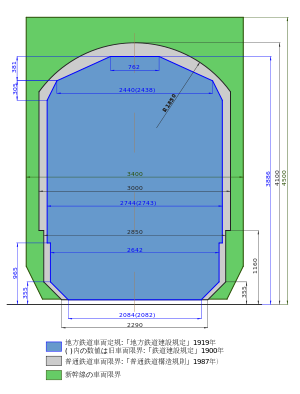 However, the specification in each plate shows a car cross-section that is chamfered at the top and bottom, meaning that a compliant car is not permitted to fill an entire rectangle of the maximum height and width. Double-stack container service requires the highest loading gauge in common use in North America. Boeing 737NG fuselage being transported by rail. Technically, Plate B is still the maximum[clarification needed] and the circulation of Plate C is somewhat restricted. The prevalence of excess-height rolling stock, at first ~18 ft (5.5 m) piggybacks and hicube boxcars, then later autoracks, airplane parts cars, and flatcars for hauling Boeing 737 fuselages, as well as 20 ft 2 in (6.15 m) high double-stacked containers in container well cars, has been increasing. This means that most, if not all, lines are now designed for a higher loading gauge. The width of these extra-height cars is covered by Plate C-1. All the Class I rail companies have invested in longterm projects to increase clearances to allow double stack freight. The mainline North American rail networks of the Union Pacific, the BNSF, the Canadian National, and the Canadian Pacific, have already been upgraded to Plate K. This represents over 60% of the Class I rail network. Standard AAR passenger loading-gauge (does not accommodate Amtrak "Superliners" nor ex-AT&SF "Hi-Level" cars). The old standard North American passenger railcar is 10 ft 6 in (3.20 m) wide by 14 ft 6 in (4.42 m) high and measures 85 ft 0 in (25.91 m) over coupler pulling faces with 59 ft 6 in (18.14 m) truck centers, or 86 ft 0 in (26.21 m) over coupler pulling faces with 60 ft 0 in (18.29 m) truck centers. In the 1940s and 1950s, the American passenger car loading gauge was increased to a 16 ft 6 in (5.03 m) height throughout most of the country outside the Northeast, to accommodate dome cars and later Superliners and other double-decker commuter trains. Bilevel and Hi-level passenger cars have been in use since the 1950s, and new passenger equipment with a height of 19 ft 9 1⁄2 in (6.03 m) has been built for use in Alaska and the Canadian Rockies. See Bilevel rail car. The structure gauge of the Mount Royal Tunnel limits the height of bilevel cars to 14 feet 6 inches (4.42 m). The New York City Subway is an amalgamation of three former constituent companies, and while all are standard gauge, inconsistencies in loading gauge prevent cars from the former BMT and IND systems (B Division) from running on the lines of the former IRT system (A Division), and vice versa. This is mainly because IRT tunnels and stations are approximately 1 foot (305 mm) narrower than the others, meaning that IRT cars running on the BMT or IND lines would have platform gaps of over 8 inches (203 mm) between the train and some platforms, whereas BMT and IND cars would not even fit into an IRT station without hitting the platform edge. Taking this into account, all maintenance vehicles are built to IRT loading gauge so that they can be operated over the entire network, and employees are responsible for minding the gap. Another inconsistency is the maximum permissible railcar length. Cars in the former IRT system are 51 feet (15.54 m) as of December 2013[update], but can be as long as 64 feet (19.51 m). Railcars in the former BMT and IND can be longer: on the former Eastern Division, the cars are limited to 60 feet (18.29 m), while on the rest of the BMT and IND lines plus the Staten Island Railway (which uses modified IND stock) the cars may be as long as 75 feet (22.86 m). Major trunk raillines in East Asian countries, including China, North Korea, South Korea, as well as the Shinkansen of Japan, have all adopted a loading gauge of 3,400 mm (11 ft 2 in) maximum width and can accept the maximum height of 4,500 mm (14 ft 9 in). The max. height, width, and length of Chinese rolling stock are 4,800 mm (15 ft 9 in), 3,400 mm (11 ft 2 in) and 26 m (85 ft 4 in). China is building numerous new railways in sub-Sahara Africa and Southeast Asia (such as in Kenya and Laos), and these are being built to "Chinese Standards". This presumably means track gauge, loading gauge, structure gauge, couplings, brakes, electrification, etc. Trains on the Shinkansen network operate on standard-gauge (1,435 mm) track and have a loading gauge of 3,400 mm (11 ft 2 in) maximum width and 4,500 mm (14 ft 9 in) maximum height. However some Shinkansen trains are wider, such as E1 Series Shinkansen. This allows the operation of double-deck high-speed trains. Mini Shinkansen (former conventional narrow gauge lines that have been regauged into standard gauge) and some private railways in Japan (including some lines of the Tokyo subway and all of the Osaka Metro) also use standard gauge; however, their loading gauges are different. The rest of Japan's system is discussed under #Narrow gauge, below. The South Korean national network has the same loading gauge as Japanese Shinkansen. The body frame may have a maximum height of 4,500 mm (180 in) and a maximum width of 3,400 mm (130 in) with additional installations allowed up to 3,600 mm (140 in). That width of 3,400 mm is only allowed above 1,250 mm (49 in) as the common passenger platforms are built to former standard trains of 3,200 mm (130 in) in width. The standard gauge lines of New South Wales Government Railways (NSWGR) allowed for a width of 9 ft 6 in (2.90 m) until 1910, after a conference of the states created a new standard of 10 ft 6 in (3.20 m), with corresponding increase in track centres. The narrow widths have mostly been eliminated, except, for example, at the mainline platforms at Gosford railway station and some sidings. The longest carriages are 72 ft 6 in (22.10 m). The Commonwealth Railways adopted the national standard of 10 ft 6 in (3.20 m) when they were established in 1912, although no connection with New South Wales was made until 1970. The height of the NSW loading gauge just happens to allow for double decker trains in Sydney, while the Victorian loading gauge (in this populous city), which is similar to Swedish SE-A loading gauge, is not quite tall enough to allow for double deck trains in Melbourne (except for one experimental train). An NSW HV Composite Bogie Brake Van of 1884 was 8 ft 3.5 in (2.527 m) wide and 11 ft 5 in (3.48 m) tall. A double deck Electric Tangara train of the late 1980s was 3,000 mm (118.1 in) wide. Track centres from Penrith railway station to Mount Victoria railway station and Gosford and Wyong have been gradually widened to suit. The proposed Korean manufactured intercity sets are however 3,100 mm (122.0 in) wide, so further, costly modification will be required beyond Springwood. The smallest loading gauge for a railway of the 1,676 mm (5 ft 6 in) gauge track is Delhi Metro, which is 3,250 mm (10 ft 8 in) wide and 4,140 mm (13 ft 7 in) high. Indian Railways and Pakistan Railways (also 1,676 mm gauge track) have very large loading gauge. 3,660 mm (12 ft 0 in) wide and 5,300 mm (17 ft 5 in) high for passenger traffic. In India and Pakistan, 3,250 mm (10 ft 8 in) wide and 7,000 mm (23 ft 0 in) high on the freight only lines, and 3,250 mm (10 ft 8 in) wide and 6,150 mm (20 ft 2 in) high on the passenger lines. In Finland, the rails cars can be up to 3.4 m (11 ft 2 in) wide with a permitted height from 4.37 m (14 ft 4 in) on the sides to 5.3 m (17 ft 5 in) in the middle. The Russian loading gauges are defined in standard GOST 9238 (ГОСТ 9238-83, ГОСТ 9238-2013) with the current 2013 standard named "Габариты железнодорожного подвижного состава и приближения строений" (construction of rolling stock clearance diagrams [official English title]). It was accepted by the interstate council for standardization, metrology and certification [ru] to be valid in Russia, Belarus, Moldova, Ukraine, Uzbekistan and Armenia. The standard defines static envelopes for trains on the national network as T, Tc and Tpr. The static profile 1-T is the common standard on the complete 1520 mm rail network including the CIS and Baltic states. The structure clearance is given as S, Sp and S250. There is a tradition that structure clearance is much bigger than the common train sizes. For international traffic, the standard references the kinematic envelope for GC and defines a modified GCru for its high-speed trains. For other international traffic, there are 1-T, 1-VM, 0-VM, 02-VM and 03-VMst/03-VMk for the trains and 1-SM for the structure clearance. The main static profile T allows for a maximum width of 3,750 mm (12 ft 3.6 in) rising to a maximum height of 5,300 mm (17 ft 4.7 in). The profile Tc allows that width only at a height of 3,000 mm (9 ft 10.1 in), requiring a maximum of 3,400 mm (11 ft 1.9 in) below 1,270 mm (50.0 in), which matches with the standard for train platforms (with a height of 1,100 mm [43.3 in]). The profile Tpr has the same lower frame requirement but reduces the maximum upper body width to 3,500 mm (11 ft 5.8 in). The more universal profile 1-T has the complete body at a maximum width of 3,400 mm (11 ft 1.9 in) still rising to a height of 5,300 mm (17 ft 4.7 in). The structure gauge S requires buildings to be placed at minimum of 3,100 mm (10 ft 2.0 in) from the track centreline. Bridges and tunnels must have a clearance of at least 4,900 mm (16 ft 0.9 in) wide and 6,400 mm (21 ft 0 in) high. The structure gauge Sp for passenger platforms allows 4900 mm only above 1100 mm (the common platform height) requiring a width of 3,840 mm (12 ft 7.2 in) below that line. The main platform is defined to have a height of 1,100 mm (43.3 in) at a distance of 1,920 mm (75.6 in) from the center of the track to allow for trains with profile T. Low platforms at a height of 200 mm (7.9 in) may be placed at 1,745 mm (68.7 in) from the center of the track. A medium platform is a variant of the high platform but at a height of 550 mm (21.7 in). The latter matches with the TSI height in Central Europe. In the earlier standard from 1983, the profile T would only be allowed to pass low platforms at 200 mm while the standard high platform for cargo and passenger platforms would be placed no less than 1,750 mm (68.9 in) from the center of the track. That matches with the Tc, Tpr and the universal 1-T loading gauge. Narrow gauge railways generally have a smaller loading gauge than standard gauge ones, and this is a major reason for cost savings rather than the railgauge itself. For example, the Lyn locomotive of the Lynton and Barnstaple Railway is 7 feet 2 inches (2.18 m) wide. By comparison, several standard gauge 73 class locomotives of the NSWR, which are 9 feet 3 inches (2.82 m) wide, have been converted for use on 610 mm (2 ft) cane tramways, where there are no narrow bridges, tunnels or track centres to cause trouble. The 6E1 locomotive of the 1,067 mm (3 ft 6 in) South African Railways are 9 feet 6 inches (2.9 m) wide. A large numbers of railways using the 762 mm (2 ft 6 in) gauge used the same rolling stock plans, which were 7 ft 0 in (2.13 m) wide. width (brakevan mirrors) = 6 feet 10 inches (2.08 m). width (brakevan body) = 6 feet 0 inches (1.83 m). height = 5 feet 7.5 inches (1.715 m). length = (carriage) 36 feet 0 inches (10.97 m). Japanese national network operated by Japan Railways Group employs narrow gauge 1,067 mm (3 ft 6 in) and has maximum width of 3,000 mm (9 ft 10 in) and maximum height of 4,100 mm (13 ft 5 in); however, a number JR lines were constructed as private railways prior to nationalisation in the early 20th century, and feature loading gauges smaller than the standard. These include the Chūō Main Line west of Takao, the Minobu Line, and the Yosan Main Line west of Kan'onji　(3,900 mm (12 ft 10 in) height). Nevertheless, advances in pantograph technology have largely eliminated the need for separate rolling stock in these areas. There are many private railway companies in Japan and the loading gauge is different for each company. The South African national network employs 1,067 mm (3 ft 6 in) gauge, and has maximum width of 3,048 mm (10 ft) and maximum height of 3,962 mm (13 ft), which is greater than the normal British loading gauge for standard gauge vehicles. New Zealand Railways uses 1,067 mm (3 ft 6 in) gauge. The maximum width is 2,830 mm (9 ft 3 in) and maximum height is 3,815 mm (12 ft 6 in). minimum radius 132 feet (40 m). width 7 feet 0 inches (2.13 m) see Everard Calthrop. Increasing the structure gauge can involve substantial work. The UK's Midland Main Line being upgraded in 2014. The structure gauge, which refers to the dimensions of the lowest and narrowest bridges or tunnels of the track, complements the loading gauge, which specifies the tallest and widest allowable vehicle dimensions. There is a gap between the structure gauge and loading gauge, and some allowance needs to be made for the dynamic movement of vehicles (sway) to avoid mechanical interference causing equipment and structural damage. While it may be true that trains of a particular loading gauge can travel freely over tracks of a matching structure gauge, in practice, problems can still occur. In an accident at Moston station, a platform not normally used by freight trains was in fact "out of gauge", and was hit by an in-gauge train. Trains larger than the loading gauge, but not too large, can operate if the structure gauge is carefully measured, and the trip is subject to various special regulations. ^ "Glossary". NetworkRail.co uk. Network Rail. Archived from the original on 6 May 2009. Retrieved 15 May 2009. ^ "European Loading Gauges". www.crowsnest.co.uk. Archived from the original on 13 February 2010. ^ Douglas Self. "A Word on Loading Gauges". Archived from the original on 3 March 2016. ^ "HS2 Cost and Risk Model Report" (PDF). p. 15. Archived (PDF) from the original on 20 October 2013. ^ a b c "European Loading Gauges". Modern Railways. April 1992. Archived from the original on 13 February 2010. ^ a b c "GE/GN8573 Guidance on Gauging, Issue 3" (PDF). London: Rail Safety and Standards Board. October 2009: 20. Archived from the original (PDF) on 7 September 2012. Retrieved 2 July 2013. ^ a b c Mike Smith (2003). "Track Gauge & Loading Gauge". Archived from the original on 12 August 2009. ^ "Leaflet 506 – Rules governing application of the enlarged GA, GB, GB1, GB2, GC and GI3 gauges". Archived from the original on 7 October 2011. Retrieved 27 May 2009. ^ EUR-Lex (28 July 2006). "TSI CR WAG; 02006D0861-20130124; Annex C: Track interaction and gauging". Archived from the original on 19 October 2015. Retrieved 7 October 2015. ^ "Verladerichtlinien der DB Schenker Rail AG (UIC – Verladerichtlinien); Tafel 1 Sammlung der Lademasse" (in German). 1 July 2014. Archived from the original on 19 October 2015. Retrieved 6 October 2015. ^ Jacques Molinari (April 1999). "Transport combiné et infrastructures ferroviaires; Compléments 1 – Terminologie – Chargements – Gabarits – Institutions" (PDF) (in French). Archived (PDF) from the original on 6 March 2016. Retrieved 29 September 2015. ^ "Freight Opportunities Stage 2 Part 3 – Available Space Assessment – ISO Container Routes" (PDF). Rail and Safety Standards Board. September 2007. 7481- LR- 009 issue 1. Archived from the original (PDF) on 27 September 2011. (2 Definitions)‘W’ Gauge. A set of static gauges that defines the physical size of freight vehicles. [...] (3 Methodology) It was assumed that the container / wagon combinations under consideration already conform to the dimensions set out in the lower sector structure gauge. Therefore, only structural clearances above 1,100 mm (43.31 in) above rail level were assessed. ^ "The V/S SIC Guide to British gauging practice" (PDF). Rail and Safety Standards Board. January 2013. Archived (PDF) from the original on 19 October 2016. Retrieved 19 February 2018. Mark 3 coaches are labeled C3 restriction and Class (Pendolino) trains are labeled C4. These do not refer to any standard gauge. ^ "GE/GN8573" (PDF). Archived from the original (PDF) on 29 September 2011. Retrieved 15 May 2009. ^ "Business Plan 2004 - Network Capability" (PDF). Network Rail. Archived from the original (PDF) on 29 September 2012. Retrieved 15 May 2009. ^ "Megafret" (PDF). ersrail.com. Archived from the original (PDF) on 5 July 2015. Retrieved 22 November 2012. ^ a b c "TEN PROPOSED ENHANCEMENT SCHEMES IN SCOTLAND". Freight on rail. Archived from the original on 18 November 2008. Retrieved 17 May 2009. ^ "Standard Shipping Containers". Container container. Archived from the original on 7 July 2009. Retrieved 18 May 2009. ^ "24 November 2006 Freight RUS Consultation Response National RUS" (PDF). Central Railways. Archived from the original (PDF) on 7 August 2008. Retrieved 17 May 2009. ^ a b "Freight RUS" (PDF). Archived (PDF) from the original on 2 March 2012. ^ "Strategic Freight Network: The Longer-Term Vision". Department for Transport. Archived from the original on 4 May 2011. Retrieved 2009-05-17. ^ "New SRA Gauging Policy Aims to Make Best Use of Network Capability" (PDF). Department for Transport. Archived from the original (PDF) on 2009-05-12. Retrieved 2009-05-15. ^ "Spårteknik – Fritt utrymme utmed banan" (PDF) (in Swedish). Trafikverket. 15 May 1998. Archived from the original (PDF) on 30 January 2013. Retrieved 18 September 2012. ^ a b c d Association of American Railroads; Mechanical Division (15 May 1966). "Car and locomotive cyclopedia of American practice". Car and locomotive cyclopedia of American practice. Archived from the original on 7 November 2012 – via Open WorldCat. ^ "Comparaison des gabarits UIC et nord-américains (Comparison of UIC and North American Gauges)". Marc Dufour. Archived from the original on 12 September 2009. Retrieved 16 October 2009. ^ "Railway line clearances and car dimensions including weight limitations of railroads in the United States, Canada, Mexico and Cuba". Railway line clearances and car dimensions including weight limitations of railroads in the United States, Canada, Mexico and Cuba. Archived from the original on 13 December 2014 – via Open WorldCat. ^ Dufour, Marc. "CoupeTunnelDouble" (GIF). La ligne de banlieue Montréal – Deux-Montagnes & le réseau ferré de banlieue. Archived from the original on 10 October 2007. Retrieved 13 May 2008. ^ Clarke, Bradley (1981). The Boston Rapid Transit Album. Cambridge, Mass. : Boston Street Railway Association. p. 8. ^ Fischler, Stanley I. (1979). Moving millions : an inside look at mass transit (1st ed.). New York: Harper & Row. ISBN 0-06-011272-7. ^ 久保田博 (1997-02-13). 鉄道工学ハンドブック (in Japanese). グランプリ出版. pp. 148–149. ISBN 4-87687-163-9. 和書. ^ 鉄道に関する技術上の基準を定める省令等の解釈基準 (PDF) (in Japanese). Ministry of Land, Infrastructure, Transport and Tourism. ^ a b c Hiroshi Kubota (1997-02-13). Railway Engineering Handbook (in Japanese). Grand Prix publishing. p. 148. ISBN 4-87687-163-9. ^ "New intercity trains too wide for rail line to stations in Blue Mountains". Sydney Morning Herald. Archived from the original on 1 January 2017. Retrieved 10 May 2017. ^ "Lastprofiler Finland" (in Swedish). Green Cargo. 15 December 2009. Archived from the original on 11 November 2011. Retrieved 18 September 2012. ^ a b c d e f "ГОСТ 9238-2013". 1 July 2014. Archived from the original on 15 April 2018. ^ "ГОСТ 9238-83 Габариты приближения строений и подвижного состава железных дорог колеи 1520 (1524) мм". vsegost.com. Archived from the original on 17 September 2016. ^ Festiniog Railway Volumn Two by James Boyd p365. ISBN 0-85361-168-8. ^ "THE FESTINIOG RAILWAY". Rockhampton Bulletin. Qld. 17 April 1873. p. 3. Retrieved 3 December 2011 – via National Library of Australia. ^ "National Rail System Standard 6 – Engineering Interoperability Standards" (PDF). KiwiRail. 12 April 2013. Archived (PDF) from the original on 24 January 2016. Retrieved 6 September 2015. ^ "Here is a platform alteration". rail.co.uk. 17 February 2015. Archived from the original on 20 August 2016. ^ "Report 17/2015: Trains struck platform at Moston, Manchester". gov.uk. Rail Accident Investigation Branch. 7 October 2015. Archived from the original on 24 September 2016. Jane's World Railways yearbook contains many though not all loading gauge diagrams. Railway line clearances and car dimensions including weight limitations of railroads in the United States, Canada, Mexico and Cuba.